With its colors of red and green, and its sparkling dewiness, it will rival your Christmas tree for beauty and smell. Better yet, you get to EAT it, while the tree ends up on your curb. Before you click off of here and go look at the latest cookie recipes, hear me out! This salad is made with kale, which is one of the healthiest foods you can eat. 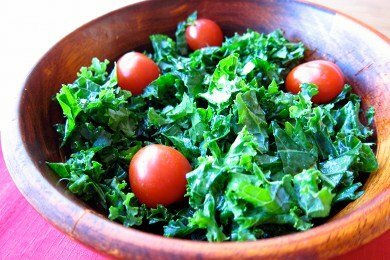 One serving of this salad includes 206% of your daily value of Vitamin A. Kale is just a festival of nutrients. Kale is CHEAP and in season right now. I bought over 2 pounds for $1.33. Because kale is a winter green it is tougher than lettuce and will keep in your fridge for longer. This salad can be prepared in 5 minutes! The key to eating raw kale is chopping it into little bits. Obviously, trying to eat a leaf of kale (like a leaf of lettuce) with be next to impossible so you have to pre-chew it with your kitchen knife. After you wash the kale, and strip it from its stem, you just chop it into small pieces and toss it into your salad bowl. Then the fun part starts! What we DON'T want to do is turn it into yesterday's taco salad and ruin the goodness that is kale. What we do have to do is make it taste good so you will love it. I used olive oil, Dijon mustard, lemon, salt, and some cherry tomatoes and it was brilliant. Bitter, sour, sweet, salty, crunchy - WOW! It is amazing to me how good this tastes and I would have never tried it unless my husband made it for me when he forgot to buy lettuce. He just ran out the door, picked some kale, and created this salad that I couldn't stop eating. Thin slices of parmesan (made with a vegetable peeler) would be great with this. Do you have any suggestions for preparing fresh kale salad? I've never had raw kale, but this recipe looks so good -- I might have to try it. Oh, and don't apologize for your healthy recipes! I tried the naked pear and cranberry pie for Thanksgiving -- it was a HIT! Thanks, SG! I LOVE KALE! It's my favourite veggie. Here's my tip for keeping it very happy in the fridge - treat it like a bouquet of flowers! Fill a pitcher or vase with water, trim the stems, place the kale in the pitcher, and put it in the fridge. Kale will stay super crisp and happy for a week. I love red and green, but as much as I have tried, I can't get into kale! :( I'll stick to romaine lettuce! We're on the same wavelength. I just posted about a kale and pomegranate salad. It looks like holly. How is that not festive?! I love the simplicity of the salad. Just what a big holiday dinner table needs! Love "Snack Girl." I've read when using kale, you "have" to message it for about 2 min. with extra virgin olive oil to soften this great green. Makes a big difference. Hi there, Thanks for the reminder of simplicity during "the season". I use kale interchange-ably with spinach in both fresh and cooked recipes. A side note for the cookies- I found a pin suggesting that rather than give someone a batch of cookies, give them frozen cookie dough. That way they can use it later in the year when needed. there were also suggestions for packaging and freeze-able recipes....duh! Thank you for continuing to post low calorie recipes and ideas. As a registered dietitian and Certified Diabetes Educator, I appreciate your efforts. It is especially important at this time of year when high calorie treats are everywhere. I've read that will power can take you only so far--after being confronted with goodies time after time, we often give in after resisting the first couple of times. Planning healthful alternatives is key to success! Thanks, Lisa & everyone who posted tips. I've already bought seeds so I can grow some kale next year! I'm getting so many great ideas from everyone! I never thought of adding raw kale to my diet. I used to work at a big chain restaurant where we put it out every day around the salad bar-my only experience with it! I like the above post-I too am thinking about what healthy things to plant this spring!! I promise to buy kale this week! Tenderize it by either massaging chopped kale with some salt OR put a cutting board on top of it with something heavy to press it for about 30 min. or more. ~~I usually juice my kale with fruit and drink it. Hi! I just shared on my facebook page - Annapolis Nutrition. I am loving all you advice. This is perfect. The pic is so bright and perfect for Holiday parties! I do a similar one I found on Pinterest. It used boiled eggs, turkey bacon bits, shredded carrots & corn to round it out to a full meal salad. My husband loves it!